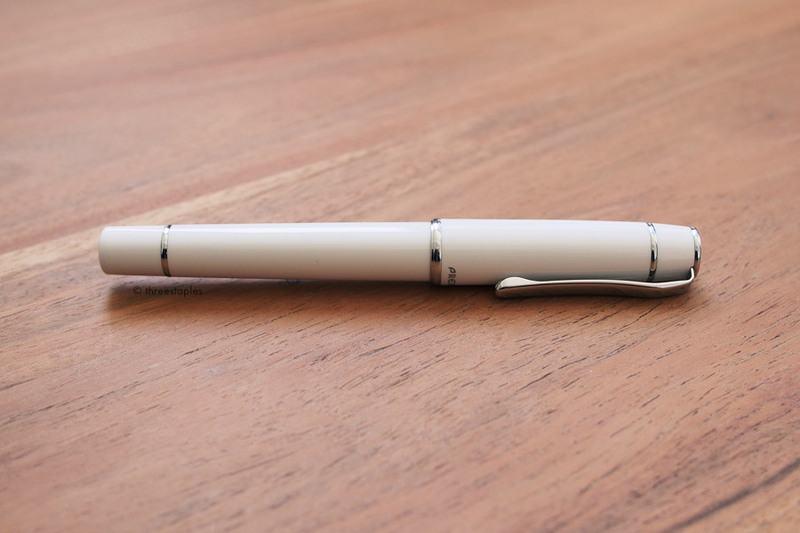 My absolute favorite writing instrument is a Pilot Prera fountain pen, glossy white with an <F> nib, to be exact. I’ve been using it almost daily for nearly three years! How did I arrive on this perfect pen? Let me tell you a little bit of that story. I started my fountain pen journey very cautiously back in 2013. What were these strange tools? I decided to test the waters with one the most affordable options out there: the Platinum Preppy. At only $5, why not give it a shot. Even at that low price point, the Preppy impressed me. The ink flowed smoothly, and there was a pleasant feedback from the nib on the paper that was completely new to me. And just like that, I became hooked on fountain pens. The Preppy didn’t really fit my style, though. The line, impressively smooth as it was for such an inexpensive pen, was too thick for my small handwriting. And the clear plastic body made of creaky plastic and covered with logos – well, let’s just say there’s a reason it only cost me $5. Where would I go from here? The fountain pen world has a huge number of brands and products, and was incredibly daunting for a beginner like me. But then I noticed something: despite all that variety, there was a remarkable sameness in the aesthetics of most fountain pens, or at least those I could see in the local stationery shops. Let’s just call them “old fashioned” pens. You know the look: cigar shape, large, heavy, black, sliver or gold trim, a thick "waistband" on the cap. Very masculine, conservative, “executive”. And can I say, boring? Such is the stereotypical fountain pen, and it’s definitely not my cup of tea. On top of that, I learned that entire brands of fountain pens were not even contenders. My handwriting is tiny, honed by many years of using 0.3mm and 0.4mm gel ink pens (I feel most “at home” writing inside a 5mm grid). European nibs would apparently be too broad for my writing; in-store testing of Lamy and Kaweco pens confirmed this. I needed a Japanese-style <F>, that was for sure. Suddenly an almost infinite number of fountain pen choices narrowed to very few. I decided it needed to be a Japanese brand, and something with a bit more personality than your typical staid pen. 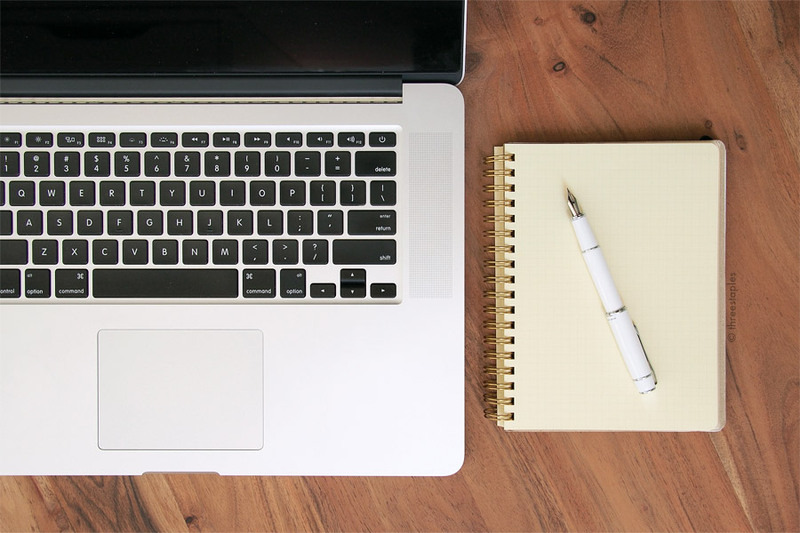 Ideally it would match the other gear on my desk: an aluminum MacBook Pro, a white plastic iPhone 5c, and trusty Helvetica-clad spiral B6 notebooks (hello, Rollbahn!). 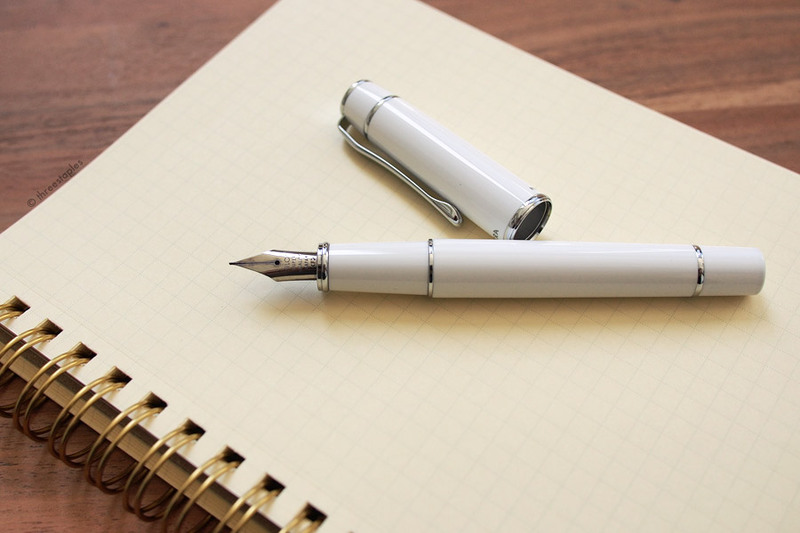 The choice was clear: a stylish Pilot Prera <F> in glossy white. My white Prera was given to me as a gift from Jinnie on Christmas of 2013, and I’ve used it ever since. I’ve tried other colors and brands of fountain pens along the way, but I always come back to the white Prera. It is the perfect pen for me, without a doubt. What makes the Prera great? First, the looks. The Prera is notable in that it is immediately recognizable as a fountain pen from the body shape, but has slightly different proportions that make it visually distinct and interesting. It is more feminine, perhaps? The pen is small (too small for me to use un-posted, by the way) and very lightweight. The chrome trim is enough to keep it classy, but not obnoxious. The Prera seems to find the right balance between traditional and minimal. Sailor Jentle Ink Shigure (Rain Showers, a very dark purple) on a Rollbahn spiral notebook (roughly B6-size). In terms of performance, the Prera is a fantastic writer. Pilot makes great nibs, of course, and the <F> here is roughly comparable to a 0.5mm gel tip in terms of line weight. The nib has pleasant feedback (close to, but not quite "scratchy") and is firm. My lines never skip and the pen always starts well. That said, the Prera’s only drawback in terms of writing is that the nib will start to go dry if you pause for a minute or two without capping. In this case it might take a stroke or two for the ink to start flowing again; replacing and removing the cap will also "wake" it back up. 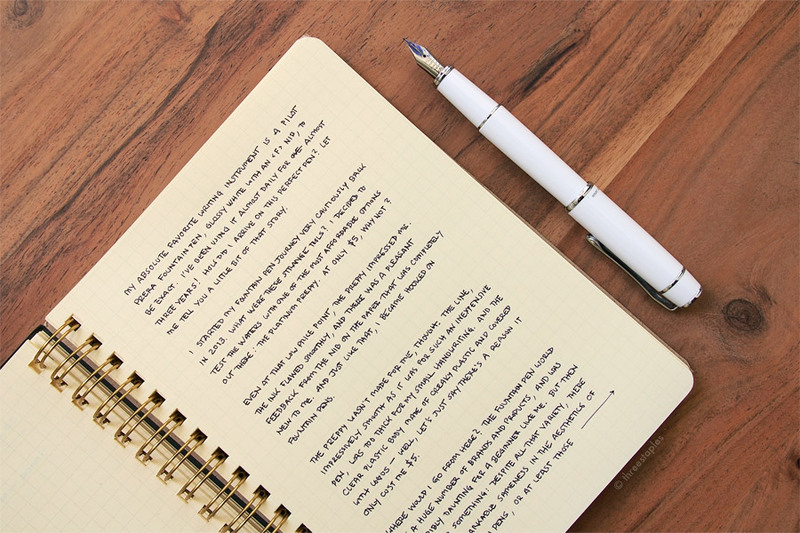 Like most fountain pens, the Prera seems designed for long-form writing, not stop and start jotting of notes. The Prera comes with a single black cartridge in the box, but I use a Pilot CON-50 converter instead (sold separately). The inks I enjoy most are the ones from the Sailor Jentle series, which are extremely dark and rich, with just the right amount of flow. I’m also a big fan of Pilot’s Iroshizuku Yamaguri (chestnut brown). Hands-down though, my favorite aspect of the Prera is the cap: it closes with an extremely satisfying “click”. It has a great feel that seems like it belongs on a much more expensive pen. Speaking of price: the Prera's seems to have fallen significantly in recent years, from around $50 USD in 2013 to $30 USD or even lower at some online retailers today. That makes it an exceptionally good deal. There are lots of interesting colors, including demonstrator versions (i.e. clear bodied). But if you ask me, the solid glossy white is still the best. Have you tried the Prera? Is there an even better pen for me in this price range that I’m missing? Let me know in the comments! Slowly but surely I will try all of these pencils. I like these new USPS stamps, even though I don’t send postcards often. in which Brad Dowdy explains how he paired every Field Notes Colors edition with a pen or pencil. This sounds like an interesting, fun project. I bet every Field Nut’s pairings would be unique and highly personal. Late to share this but in case you missed it... There’s a special edition of Field Notes that was made for Nixon, and they were recently given away as part of a treasure hunt. You can see the locations where the prizes were hidden at Nixon's Instagram. Are YOU one of the lucky adventurers? I recently complained about the German phrases printed on the Rollbahn notebook covers here, and Sola of Pencils and Other Things gives us some insights into the deign element of Roman alphabets in Asian stationery. A very interesting topic. I used to use these brushes for sketching and really liked them. I agree, it probably doesn’t hurt to carry them protected; I carried them in a ziploc bag. Reading this review made me want to get mine out and experiment again. I don’t own a Prera but M does, and I really like it. It’s not heavy, and the soft “click” of the cap does feel satisfying and luxurious. A bit thin for me but I was impressed! Darker and smoother than I expected. Yet another Hello Kitty limited edition from Japan. But how cute is it that the refills have characters printed on them? Already out in Japan since mid-June, who knows when they’ll be available overseas. Have you ever looked at the back of Field Notes buttons? See those texts along the rim? They’re called backrim text. I learn something new every day. Heh, I made ⤜(•ᴥ•)⤏ with this generator. Hope you all have a wonderful week. And happy Fourth of July!